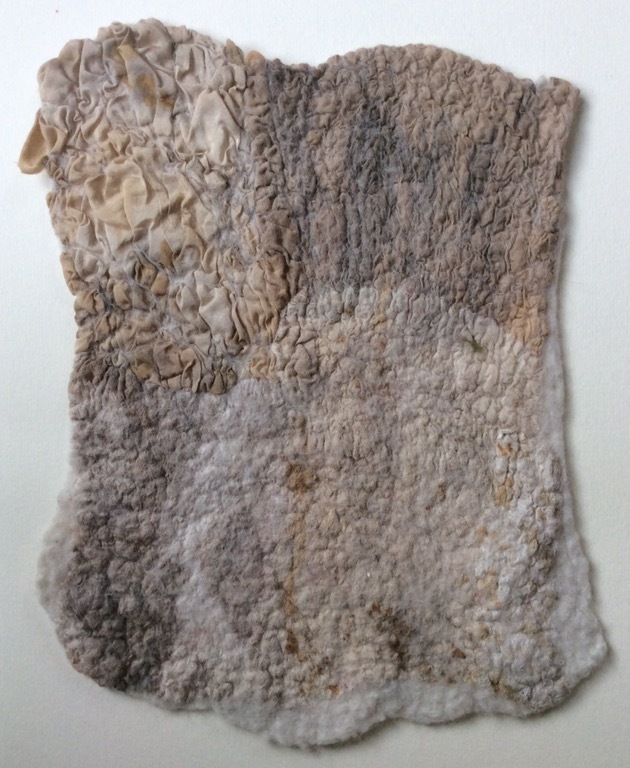 Nuno Felting with Clare Bullock…..
What had looked like being a pretty normal week suddenly took a more interesting turn on Wednesday. 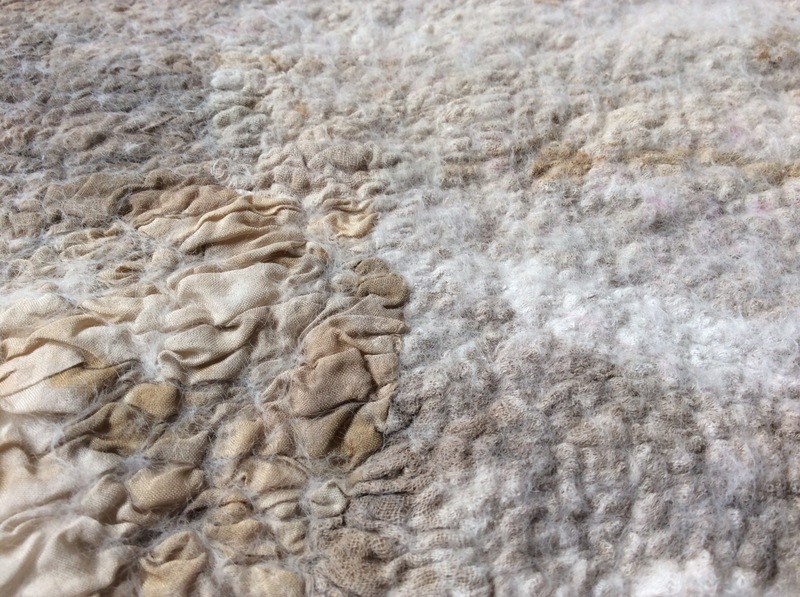 I received the Artvango newsletter which mentioned there was a spare place on Clare Bullock’s two day nuno felting workshop, starting the following day. Hmmmm…that would have been nice I thought, as I finished my lunch and set off back to work for the afternoon. Unfortunately Artvango isn’t exactly on my doorstep so it’s not somewhere I get to visit as often as I would like. 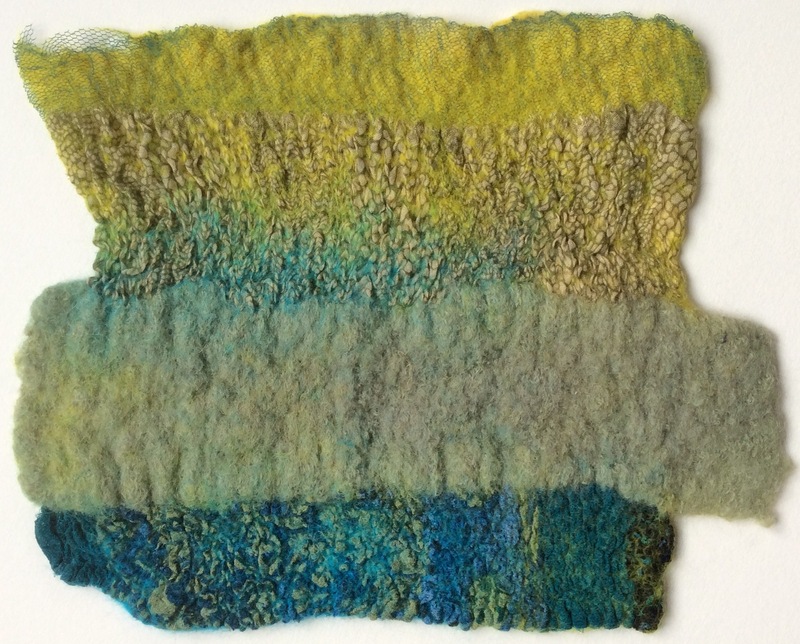 But two days felting, with Clare, starting tomorrow…..it’s got to be worth the long drive down to Knebworth, and it was! 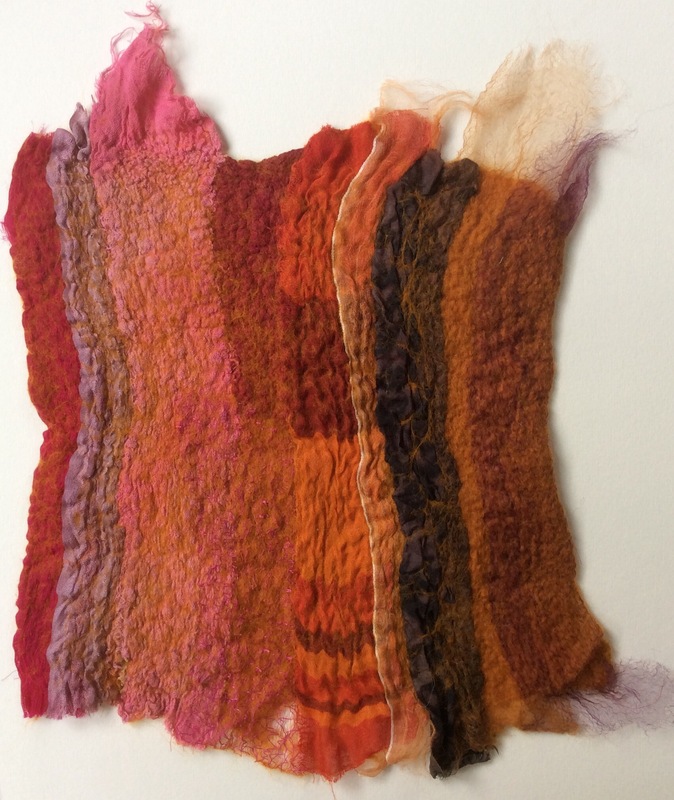 Clare began by talking us through the process and showing us examples of her nuno felting using various different fabrics i.e. silk, gauze, muslin, Indian cotton, etc. 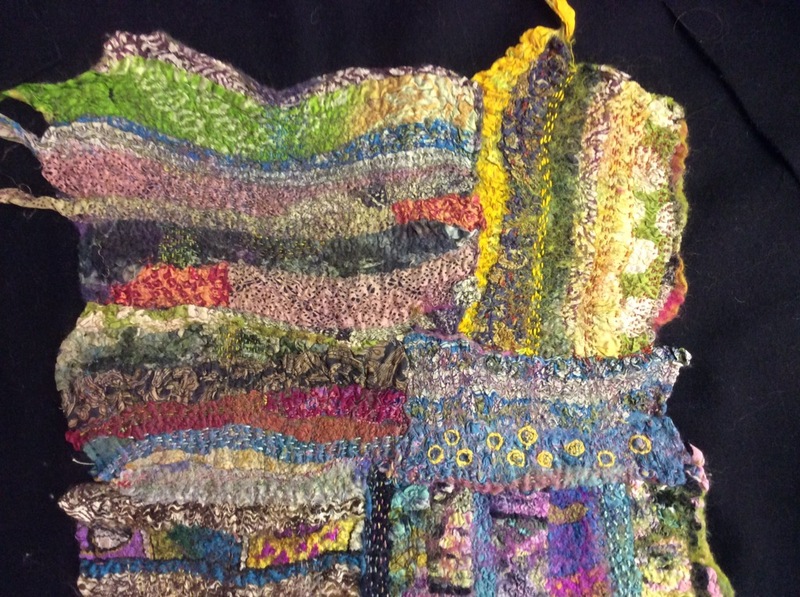 The following three photos are examples of Clare’s beautiful nuno work. 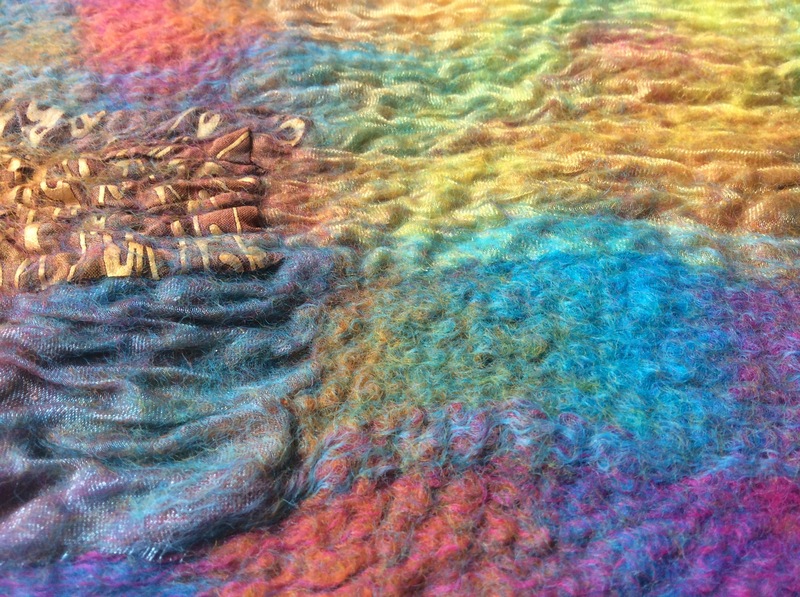 In the next photo you can see nine different scraps of scarves in the early stage of felting. And the finished sample which I was really pleased with. My green and blue sample worked pretty well too and I can see this possibly becoming a base for a landscape piece. 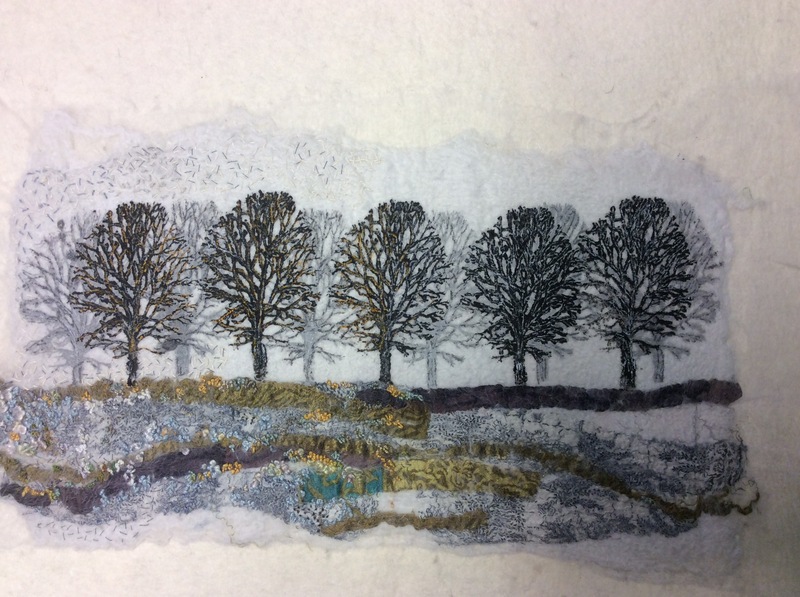 Another of my samples which I will add stitching to at some point…..
Before the workshop Clare had prepared some rust printed fabrics which she cut up and shared with us. 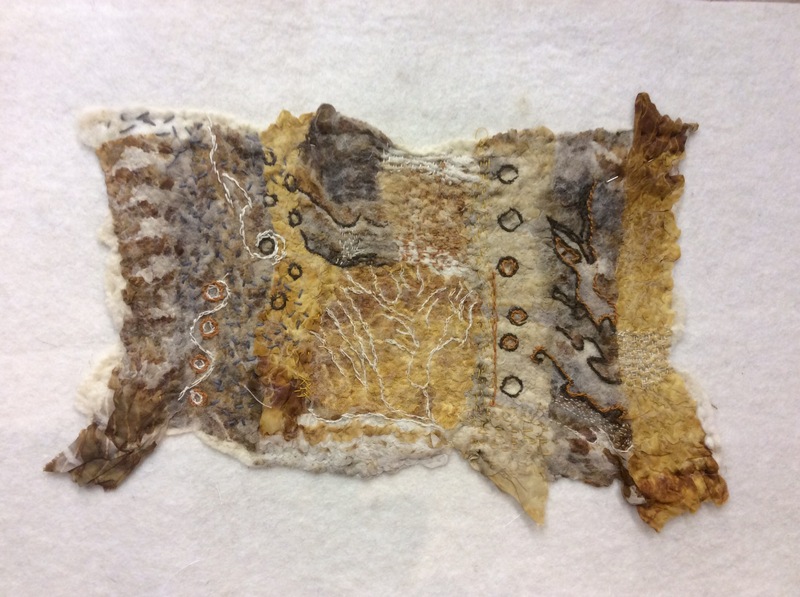 The following photo shows how my rust sample, made from four pieces of different fabrics, worked out. And another close up shot showing the textures. Clare is a very good tutor and full of fun. 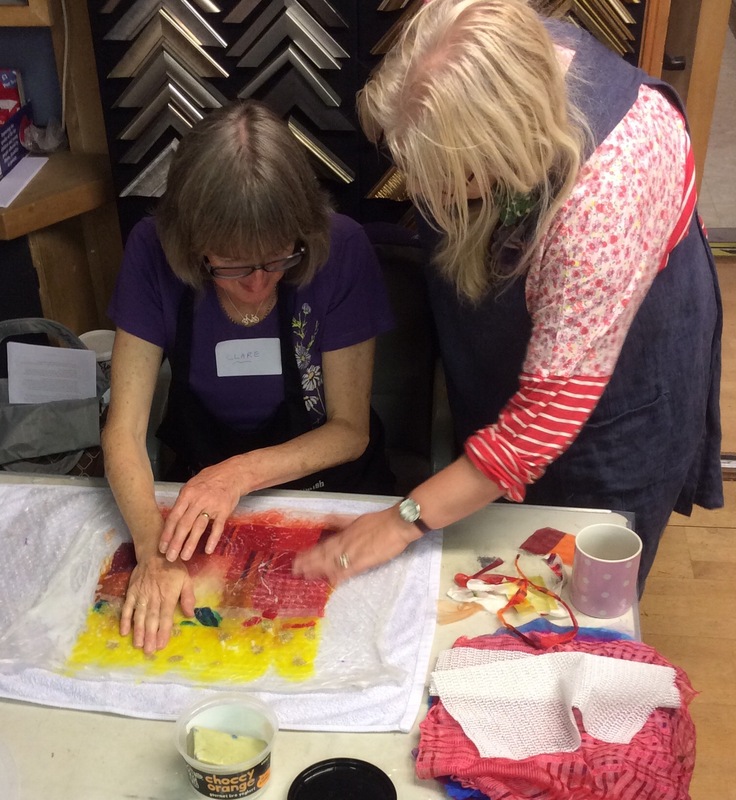 We learnt a lot and laughed a lot during the workshop, and I’m sure I can speak for the other ladies when I say that everyone came away really happy with what they had achieved. Jealous!! 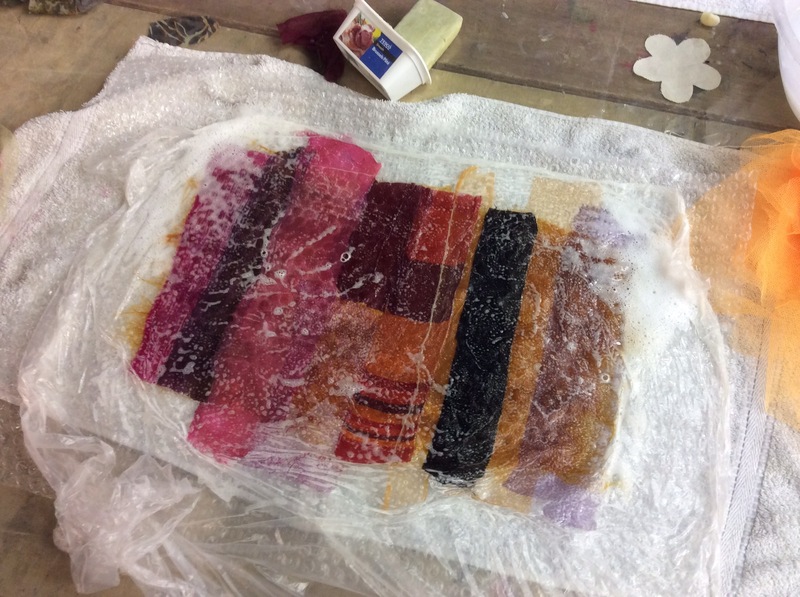 Fabulous fun resulting in gorgeous texture and colour. Glad you like them but I’m the jealous one…..your life of travelling and crafting sounds absolutely idyllic! Thanks Zed, I was pleased with them so will be doing more. Looks like a great class Karen. I do think your pieces would make great landscapes. I look forward to seeing the added stitching. Thanks Ruth. I realised last night that we also made a sample with some of Clare’s rust dyed fabrics so I’ve added that one to the post too. Wow Karen they all look great, must bring them with you when we next meet up. Will do Annette. 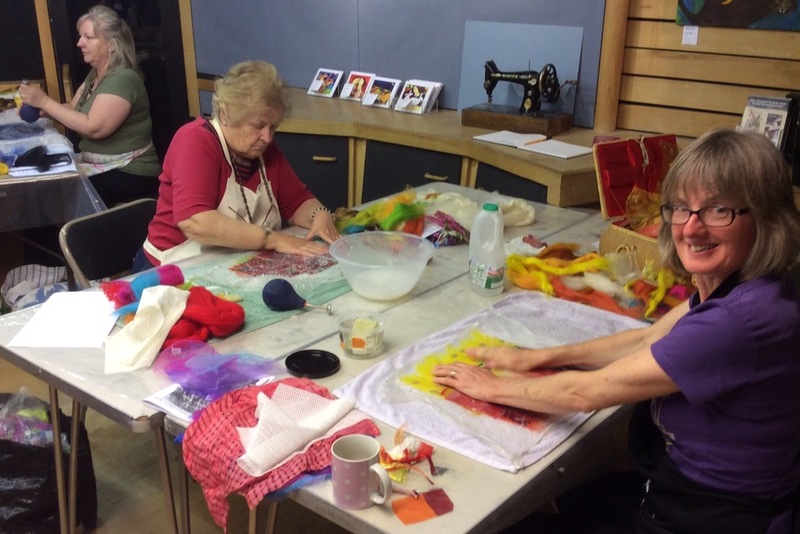 We could organise a felting play day at Cranwell sometime, I’m sure the majority would be up for it. Beautiful samples Karen! So glad you had an opportunity to join the class. It looks like a ton of fun. 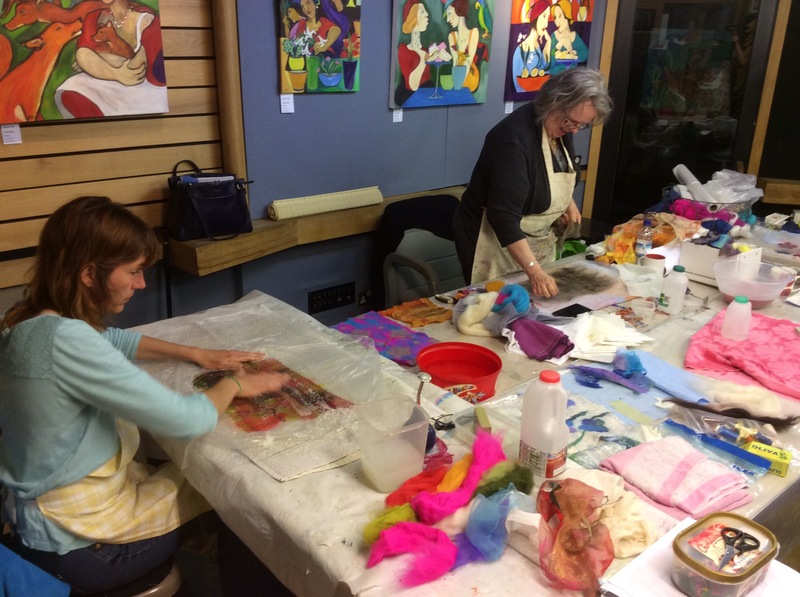 Felting with others is always a good time. You really achieved some wonderful textures. It was too good to miss Marilyn and its always a pleasure to spend time with a group of people who share your passion. So gorgeous, I love the colors and texture of all the of the swatches. The possibilities are endless. I’m off to the charity shops in the morning to hunt for more scarves!